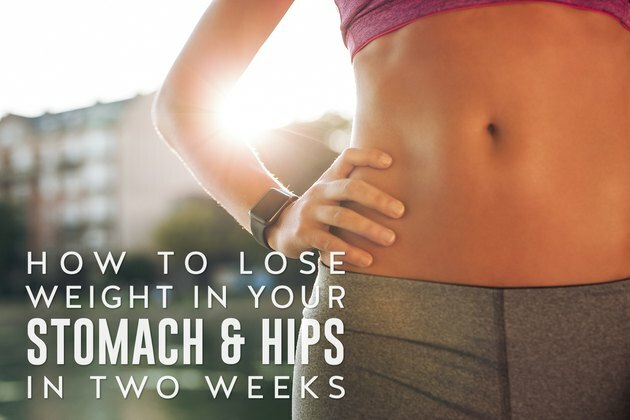 You've got just two weeks to shrink your belly and hips before swimsuit season or that high school reunion. You can certainly jumpstart a weight-loss plan and see some results in two weeks, but how much depends on your starting weight and commitment. You can't target just your belly and hips for weight loss, but a low-calorie plan that focuses on whole foods along with dedicated exercise will help you look -- and feel -- better for your big event. You may want to lose weight primarily in your hips and tummy, but know that you can't control which fat your body burns first. Fat is stored in fat cells throughout your body. Some people have more fat cells in certain "trouble" spots, which means these areas are more prone to plump up. When you reduce your calorie intake below what you burn, your body mobilizes stored fat and converts it to usable energy. You can't point to your hips or belly and tell your body that's where you want it to direct fat loss, though -- you're body loses in a set pattern determined by genetics. Women tend to store extra fat in the hips to help support a baby during pregnancy. Hip fat is subcutaneous, which means it lies just under the skin, and it's notoriously stubborn to lose. Pinchable belly fat that expands over your waistband as a muffin top is also subcutaneous and harder to lose. If, however, your stomach is larger than 35 inches around as a woman, or 40 inches around as a man, you have an abundance of visceral fat. This fat is particularly insidious as it weaves around internal organs and secretes compounds that increase your risk of health problems, such as heart disease. Because visceral fat is more metabolically active, it is also more responsive to exercise. When you first drop weight through diet and exercise, you can lose visceral fat from deep in your belly sooner than you can drop the subcutaneous fat. Having a short timeline for your weight loss might tempt you to follow a fad diet that promises miraculous weight loss in very little time. These diets set you up for failure, however. They're often so restrictive and involved that you might have trouble maintaining them for a couple of days -- let alone two weeks. You may risk nutrient deficiencies and lose valuable muscle mass. Even if you can maintain a restrictive fad diet for two weeks, you'll likely regain the weight quickly once you go back to old habits. Two weeks gives you time to start instilling good habits that support a healthy body weight. Aim for a safe, reasonable 1- to 2-pound-per-week rate of weight loss by creating a deficit of 500 to 1,000 calories a day. You'll eat fewer calories and move more. The good news is that when you reduce your portion sizes, curb your intake of sugar and refined carbohydrates, limit sodium and exercise more, you'll lose significant water weight in the first two weeks. You'll likely drop more than 1 to 2 pounds those first two weeks and significantly reduce water retention, so you can still look slimmer at your event. Use an online calculator to help you figure out how many calories you should eat daily during the two weeks of your focused weight loss. Plug in your age, gender, size and activity level to determine how many calories your body uses daily; then subtract 500 to 1,000 from this number. Don't drop below 1,200 calories if you're a woman or 1,800 calories as a man, in an effort to lose weight faster. Eating too little can stall your metabolism and make weight loss more difficult. Eat mostly whole, natural foods such as lean proteins, fresh vegetables and fruits, low-fat dairy and whole grains. For an easy way to control calories and eyeball portions, fill half your plate with watery, fibrous vegetables -- such as lettuce, broccoli, kale, cauliflower and peppers. Then, reserve a quarter for whole grains, such as brown rice or 100-percent whole-wheat bread. Fill the last quarter with a protein low in saturated fat, including fish, chicken breast, tofu and lean ground beef. Aim to consume at least 0.6 gram of protein per pound of your body weight per day. For a 150-pound person, that's 90 grams of protein a day. This amount helps preserve lean muscle mass as you cut calories, keeps you feeling full and supports weight loss beyond the two weeks. Since you have such a short deadline for weight loss, avoid sugary treats, alcohol and refined white-flour products completely. If you aren't currently exercising, use the two weeks to become more active. Add a 15- to 20-minute brisk walk every morning and evening to achieve at least the 150 minutes of moderate-intensity cardio recommended per week by the Centers for Disease Control and Prevention. Any additional physical activity you squeeze in helps burn calories, too. Take the stairs instead of the elevator, pace while on the phone or walk an extra loop of the mall when shopping. If you regularly exercise, plan to make some of your workouts higher intensity. Add intervals -- bouts of very-high intensity work, such as sprints, alternated with bouts of lower-intensity work, such as walking -- to two or three of your weekly workouts. Such intervals help you burn fat more effectively, showed a paper published in a 2011 issue of the Journal of Obesity. You may not notice significant results in two weeks, but you'll create habits that will last past your weight-loss goal. Strength training over the two weeks won't yield tremendous muscle growth changes, but it will help offset any possible muscle loss that can occur when you reduce calories. In the long run, having a more muscular body helps with weight loss because muscle mass takes more calories to maintain than fat tissue. Aim for at least four strength workouts distributed over the two weeks, and address all the major muscle groups in the body -- the hips and abs, but also the back, arms, shoulders, chest and legs. Keep the strength training up after the two weeks to promote better posture, improved joint function and a higher metabolism. What Foods Will Help Tighten My Stomach? How Many Calories Do I Burn When Doing Crunches?